They have assisted more than 18,000 veterans and survivors of those who have fallen. They have enthused over 50,000 American youths to volunteer in their communities in honor of a soldier who was perished in battle. Close to 50 veterans have graduated from their funded internship, and almost 100 veterans, including survivors, have become advocates for their cause. 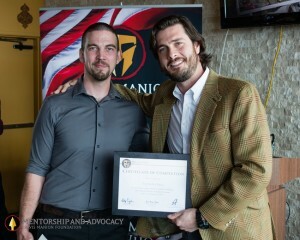 We highlight the Travis Manion Foundation (TMF) for this Honor Role edition. TMF was founded in 2007, has one office on the East Coast, and another on the West Coast. “TMF assists our nation’s veterans and families of the fallen, and honors the fallen by challenging the living,” Molly says, who specifically has the role of the Director of the Character Does Matter program. This program, through the TMF Ambassadors who lead it, encourage youth to volunteer in honor of the spirit of fallen soldiers. 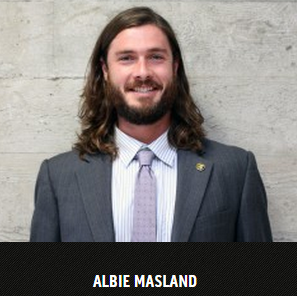 “I have always found a passion for working with people, building relationships, setting up goals and knocking them down,” says Albie Masland, who is the Veteran Outreach Manager and has a liberal arts background. Albie first came across TMF when he courageously ran over 3,000 miles all over the country to honor fallen American soldiers. The TMF team is comprised of 22 employees, 16 board members, and hundreds of volunteers, as well as partners. Those who work at TMF find that they tend to wear many different hats. “I’m fortunate to have many friends who are active duty or veteran but good humans above all,” Albie says, of his connection to the military. 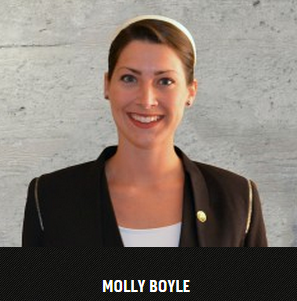 “I, myself, have never served, but I have three brothers who served as Marines – two of whom are still Reservists,” Molly adds. One story that Molly shared with us was a powerful one. A junior in high school, Chris, was sitting through a Character Does Matter presentation at a U.S. Naval Academy summer camp. During this, a slide show of those who had fallen happened to include a photo of Chris’ father, who had passed away in a helicopter crash while serving when Chris was very young. “Talk about courage, leadership, and service? Chris had it in spades,” Molly said, with pride. As far as important events on the horizon, Albie wants everyone to know there is a 9/11 Heroes Run event going on in many different American cities, but particular to San Diego, there is the 5K on September 13th. Molly is proud of a recent partnership with the USS Midway Museum, where volunteers deliver monthly Leadership Academy sessions to middle and high school students in San Diego. “I respect service above all and to have the opportunity to serve those who serve is a true honor,” Albie says. “We consider ourselves an auxiliary to their continued missions of character, service, and leadership,” Molly states, on her pride of working with TMF and helping veterans. Sign up for the Travis Manion newsletter by clicking here, and to volunteer in the San Diego area, please email CDM@travismanion.org. Visit them over on Facebook and follow over on Twitter. “Information clarity could be better on the out-boarding process and at first contact by the VA,” Albie says of veterans feeling that they have to seek out their own benefits information. “BUT it’s been improving.” We at VA HLC agree with Albie, especially in concern with the VA home loan program. For more information on the zero down payment, low-cost VA home loan, please call us at (888) 573-4496. We are also happy to connect on Twitter at @VAHomeLoanCtrs and on Facebook.